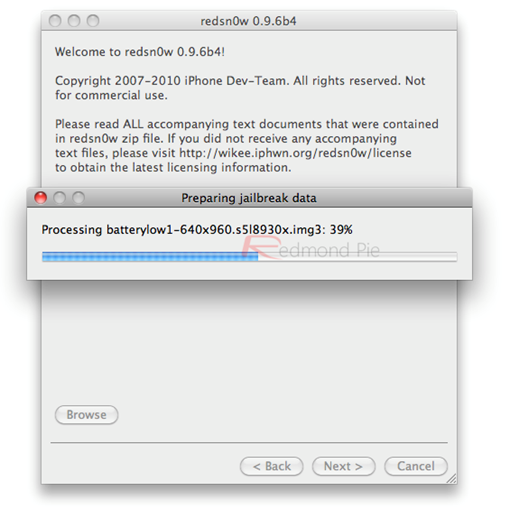 The iPhone Dev Team has just released Redsn0w 0.9.6b4 today which brings first proper jailbreak, with working Cydia and MobileSubstrate for all iOS 4.2.1 devices. For those of you who don’t know, Redsn0w 0.9.6b4 is based on Geohot’s Limera1n bootrom exploit which has already pwned all current iOS devices for life. The only problem is that it is a tethered jailbreak, which means you will have to boot it into a “jailbroken state” on every reboot. This so called tethered or semi-tethered jailbreak condition in Redsn0w 0.9.6b4 however only applies to the new devices like: iPhone 3GS (new bootrom), iPhone 4, iPod touch 2G (MC Model), iPod touch 3G and the iPod touch 4G. 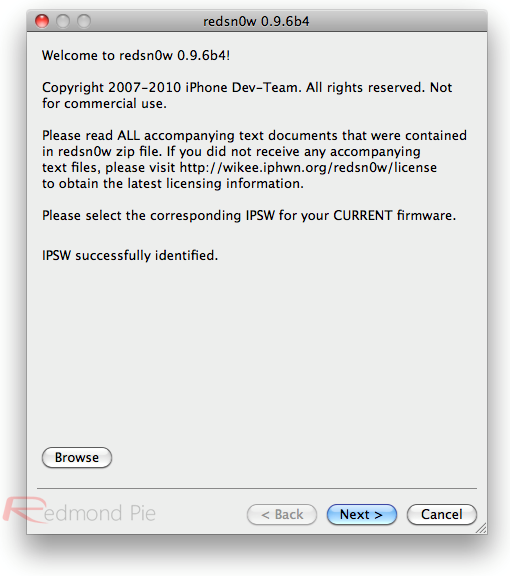 Old devices like iPhone 3GS (old bootrom), iPhone 3G, iPod touch 2G (Non-MC Model) and other devices can be jailbroken-untethered right now using this latest version of Redsn0w. So until and unless Comex of Spirit and JailbreakMe fame comes up with another untethered hack for iOS 4.2.1, the jailbreak we get for the newer devices will be tethered (or semi-tethered). NOTE: Those of you who rely on a carrier unlock MUST STAY AWAY from Redsn0w and iOS 4.2.1. Step 1) Download iOS 4.2.1. Download it according to your iOS device. Download links are given at the end of this post. Step 2) Using iTunes 10.1, Update/Restore your iOS device to iOS 4.2.1. Use the IPSW file that you have downloaded in Step 1. 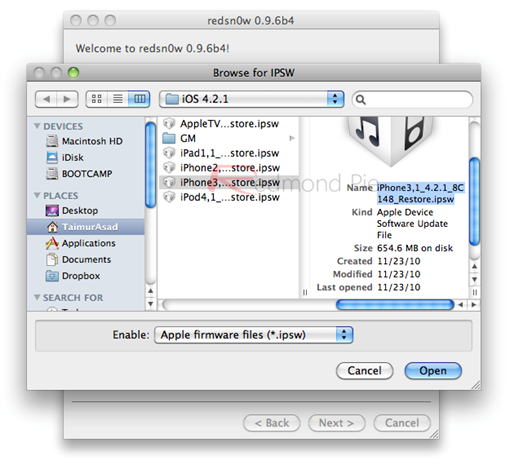 Step 3) Download Redsn0w 0.9.6b4 from the link given at the end of this post. Run it and browse for the iOS 4.2.1 ipsw file. Click “Next >” to proceed with the jailbreaking process. Step 4) Check the “Install Cydia” option to include Cydia in this firmware. You may also want to check other options mentioned there. Check them if you need them and click “Next” to proceed. 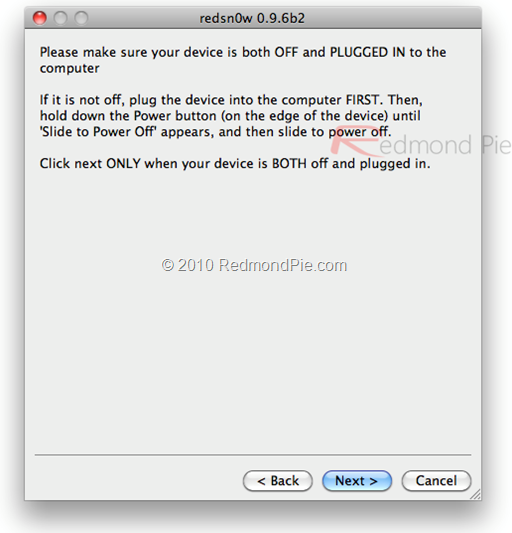 Step 5) A window will appear instructing you to power off and plug in the iOS device. Follow the instructions and proceed by clicking “Next”. After clicking next, you need to grab your iOS device to enter DFU mode. 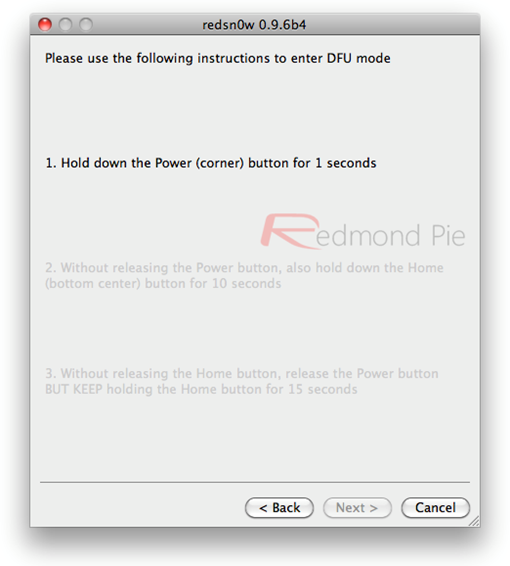 Follow the on screen instructions to enter DFU mode. Precisely, hold “Power” and “Home” button for 10 seconds and then leave “Power” button but keep holding “Home” button for further 10 seconds or until the installation begins. Step 6) It is up to Redsn0w now to do the rest. Wait while it jailbreaks your iOS device. When done, your iOS device will automatically reboot to the jailbroken iOS 4.2.1 firmware. Step 7) As the jailbreak is tethered, the device will loose the jailbroken state on every reboot. 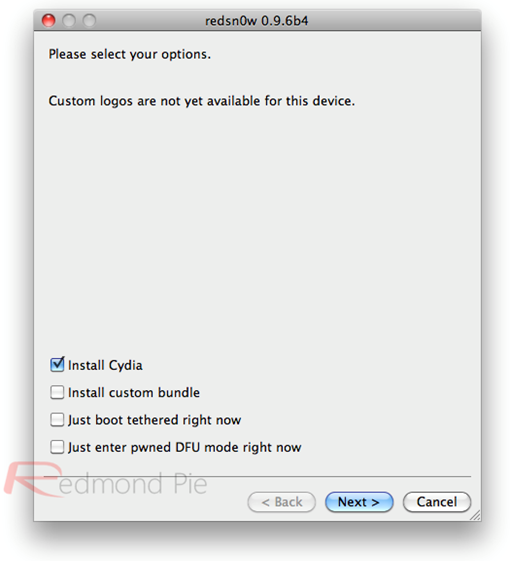 So to start the device in jailbroken state again, just select “Just boot tethered right now” option in Redsn0w. UPDATE 1: Video tutorial is up!